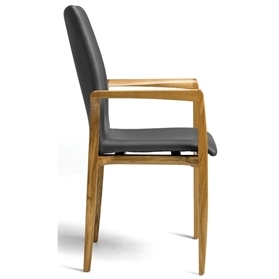 This beautiful chair is made using the finest of solid timber including Walnut, Oak, Ash and Beech. The lines of the carefully crafted and polished arms give a pleasing feel to the hand, whilst its tailored upholstery offers long term comfort in both dining and executive board meeting settings. The key additional feature of this chair is its ability to be stacked when not in use. It is both strong, stable and yet comparatively light in weight making it easy to handle. Edera is definitely a chair that will impress.